Supporting Our Youth (SOY) is a community development program designed to improve the lives of lesbian, gay, bisexual, transsexual and transgendered youth in Toronto through the active involvement of youth and adult communities. SOY works to create healthy arts, culture and recreational spaces for young people; to provide supportive housing and employment opportunities; and to increase youth access to adult mentoring and support. Recently, I sat down with with fellow George Brown student, Ryan Singh, who just recently finished up a placement with Supporting Our Youth Toronto. We covered quite a bit of ground regarding SOY’s use of arts programming in its work with LGBTQ+ youth as well as his own growth as a community worker throughout his time with SOY. He points out that SOY has allowed to him to utilize and expand upon his facilitation skills as well as operate within a diverse group environment. Individually, he is also very involved in the performing arts and we spoke about what SOY offers in terms of current programming. 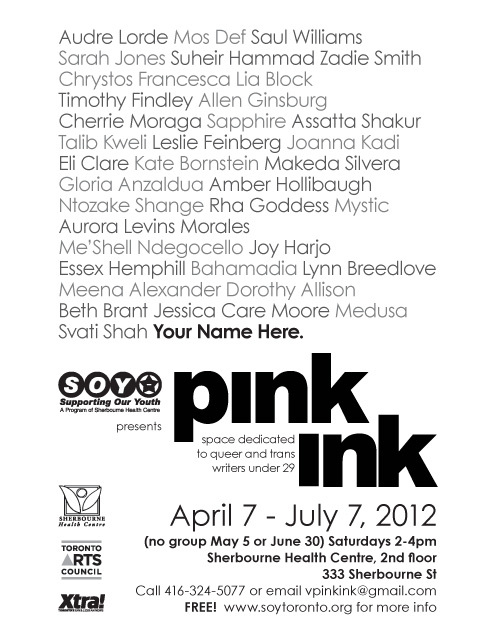 From April 7th through July 7th, SOY is offering a writing program called Pink Ink. It is facilitated by local Toronto musician and author, Vivek Shraya. In the past, participants have produced zines, poetry, short stories, essays, and more. More information about this program can be found below. Offered to queer, transgender, Two Spirit, and questioning youth (ages 14-29) who are interested in writing. It focuses on editing, performance, publication, and more! This program is also a great opportunity to meet other queer and trans individuals from all over Canada. In the past, participants have produced a variety of items including zines, poetry, short stories, essays, and more. Alex Pollard is the 2011-2012 Neighbourhood Arts Network intern. This entry was posted in Arts & Equity, Ideas, Networking, Youth and tagged Pink Ink, Sherbourne Health Centre, Supporting Our Youth, Vivek Shraya by Neighbourhood Arts Network. Bookmark the permalink.